come no closer, originally uploaded by jahansell. Closeups here - but don't get too close - as the man in the back of this picture said (and he kept his distance) - those buggers can take off an arm! "To get to the Shell station!" 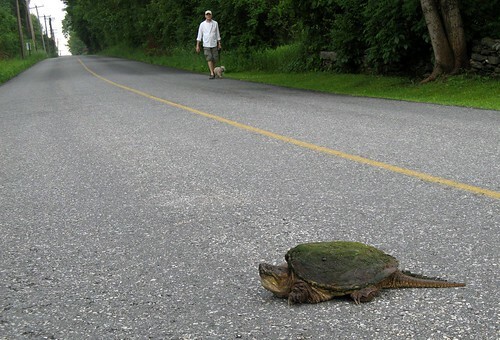 I've never seen a real, live snapping turtle. Neither did I know that turtles can have such long tails! Cool. To get on the other side. I wish we had some turtles here. Can you send a frisky male and a super female down here, and a small stream to for them to swim in? Groan at JN's answer! Too funny. I was going to offer that they are attempting to lose their tails by having a car detach it for them. I'm only familiar with box tortoises (my mom had one as a pet in our backyard for years) and water turtles. Are these guys really quick to snap? Congratulations on your third year of this series. Many happy returns of the crossings of the turtles.